Many naturals use a pick to fill in the gaps of their twist out style. They will pick the roots to fill in the lines and make the hair look fuller. 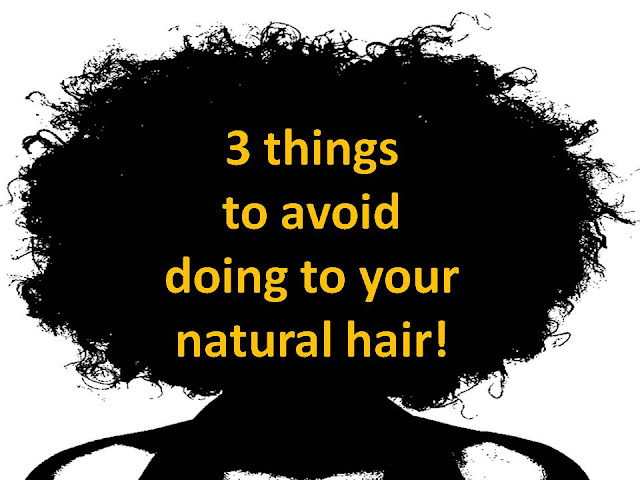 Doing so causes breakage mid shaft and eventually your hair will look thinner. When you set your twists, make your sections smaller. Untwist your hair and allow your parts to disappear on their own. When you untwist your hair, walk around, put on your makeup and give your hair time to swell naturally on its own, Only use your fingers to fill in the gaps gently, no type of pics or tools. If you frequent hair forums, youtube or hair groups, you will see some naturals rave about, aussie moist conditioner, hello hydration, tresemme and V05. Some naturals use these products for cleansing and conditioning. These products are usually full of bad ingredients. Those ingredients will instantly soften the hair and make it feel healthy. But repeated use of those ingredients will dry the hair out and slow your hair growth. The temporary instant benefits are not worth the long term bad affects. Stay away from products that contain these cheap ingredients. Invest in products which contain more natural extracts, oils and butters. Look for natural ingredients, that you can easily pronounce. These products will nourish the hair and not slow your hair growth. Crochet braids, weaves and extension braids are okay in moderation. Some naturals hid behind fake hair by calling it protective styling. The fake hair used is made of a type of plastic. As this plastic sits on top of the hair, it dries the hair out. When the extensions are removed the hair breaks and shed excessively from the chronic dryness. So while your hair grew, you lose all that length from excess shedding and breakage. Stop relying on fake hair so much. Style and grow your real hair. Follow a healthy hair care regimen for the first few years naturals. This gives you time to get to know and style your hair well. Once your hair is hydrated and healthy then you can get extensions in moderation. CHECK OUT THE BRAID RETAIN AND GROW METHOD FOR THE BEST WAY TO GROW AND RETAIN LENGTH FROM EXTENSION BRAIDS OR WEAVES. Thanks for sharing these tips! Very useful. Can you share any good shampoo / conditioner brands that I should be using on my hair? I currently use tresemme but would now like to think again. I am UK based so suggestions on any products I can buy here would be great. I thought protective style, crochet braids, weave will give my hair some relief, but boy was I wrong! My hair shredded into a palm full of my hair...all three times!